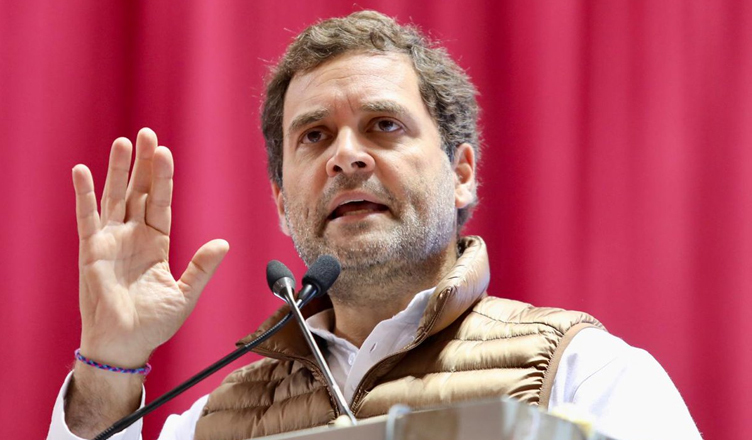 While addressing the national convention of All India Congress Committee (AICC) Minority Department, Congress president Rahul Gandhi on Thursday assured the people of India that the grand old party will always protect them no matter what their religion or caste be. “Irrespective of your language, religion, caste, Congress party will always protect you,” Gandhi said. Accusing the Modi Government of being apathetic towards the farmers and the youth, the Congress chief said it is a government only for the India’s richest. He further said that if PM Modi can give ₹3,50,000 crore to India’s 15-20 richest industrialists, then we will show him that we can give Minimum Income Guarantee to every poor Indian. Reminiscing achievements of various Indian leaders, Gandhi said that India is built by people of every religion. “When we talk about education today, we remember India’s first education minister- Maulana Azad. When we talk about Space missions- Vikram Sarabhai, Economic growth- Dr. Manmohan Singh. India is built by people of every religion,” Gandhi said. “This country doesn’t belong to any one religion or language. This country belongs to everyone,” he added. Exhibiting confidence, the Gandhi scion said that the Congress will defeat the Bharatiya Janata Party (BJP) and Rashtriya Swayamsevak Sangh (RSS) in the upcoming 2019 Lok Sabha elections. “Do not fear, in 2019 elections Congress will defeat BJP and RSS. RSS wants to remove the constitution and run the country from Nagpur. They believe they’re above everyone in this country. In 3 months, people of this country will prove them wrong,” he said. Rahul Gandhi further criticised the government for failing to do any work on all the fronts, be it economy or foreign policy. “What has BJP done in last 5 years? Demonetisation destroyed India’s economy and decreased the GDP by 2%. Narendra Modi goes to Beijing and has a dialogue with Chinese government without any agenda. Chinese government realised Mr. 56 inch is not even 4 inches. This is Mr. Modi’s character, he bowed down to China in Doklam issue,” Gandhi said. He then challenged PM Modi to indulge with him in a debate. “Narendra Modi is a coward. When he realises his opponent is fearless, Mr. Modi cowers. If BJP has any courage, they should make Mr. Modi stand with me on this stage for a debate. I will ask him some questions on economy, national security, Rafale etc,” he said. While concluding, Gandhi said that the Congress Party will always be there for the farmers, the poor and the youth.